Welcome to the CG Pride - Capital Group Team Page! For our third year, CG Pride will be participating in AIDS Walk Los Angeles. You and your family are invited to join our team. You can join the day of the event or be a virtual walker to show your support! Either way, we welcome your participation as we work to make this year even bigger and better than last year. Aside from AIDS Walk Los Angeles being a fun filled day for the entire family, it is a critical fundraiser for APLA Health. It also provides an opportunity for APLA Health to share with the community the important, life-saving work they do every day! If you have any questions, please contact Alan Walden. Betty Who & Todrick Hall will be performing at this year's Post-Walk Show! The show begins at 11:30 and will include a full slate of entertainers, which never disappoint! In the market for a baguette for dinner? Who doesn't like bread!? 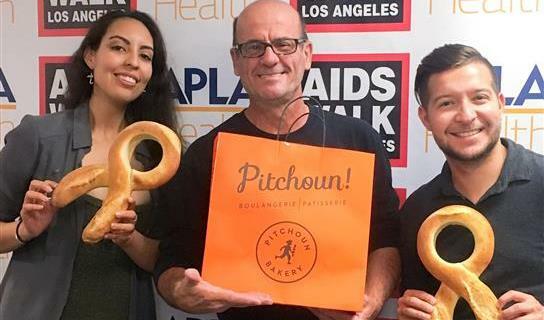 Head to Pitchoun Bakery & Cafe through 10/21 to purchase the Benefit Baguette! 50% of the proceeds will be donated to AIDS Walk Los Angeles. Check out this special message from Phillip Palmer of ABC7! Way to go, Damon! Thank you for stepping up to serve others, renew awareness, fight stigma & end the HIV-AIDS epidemic. Way to Go Michael and Damon! May the wind be at your back!! We're happy to be able to support you, Damon. You Rock!!! Thanks for giving us all the opportunity to participate in the event. I'm volunteering as well in Sign-In... say hi at the event! Thanks for raising awareness! Happy to support! Go Get 'em! I admire you for doing this! Have a great day Damon! !